The financial crisis has deepened for the shopkeepers of Chakrata Road. They are losing business since the last two months. They fear the issue of their settlement may drag for the next four to six months. The state government is also not compensating them for the losses. Hindi littérateur, communist ideologue and social activist Vidhyasagar Nautiyal was cremated at the Khadkhadi cremation ghat today. People from all walks of life attended the funeral. 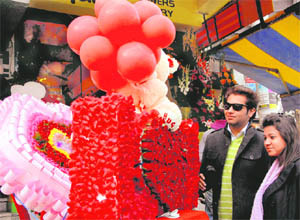 With just a few hours left for the Valentine’s Day celebrations, the heartbeats of all cupid-stricken Doonites have started striking fast for expressing feelings to their beloveds. Some are busy purchasing gifts for their loved ones while others are planning to throw party with friends or watch movie together. The sewerage project that was started from Library Bazaar on Mall Road in Mussoorie recently was stopped abruptly today after opposition by local shopkeepers. 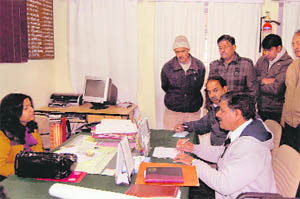 SDM, Mussoorie, Jharna Kamthan discusses the sewerage project with traders and Peyjal Nigam officials in Mussoorie. To make the younger generation aware of the importance of environment conservation, it is essential to impart them training in this regard at an early age. Rishab S Gusain won the title of healthy baby during a Baby Show organised by Poly Kids preparatory school, Saket, here today. To promote folk singers and songs of Uttarakhand, Himalayan Films Private Limited launched its new video album, ‘E Janu Re’, sung by young folk singer Kishan Mahipal here today. 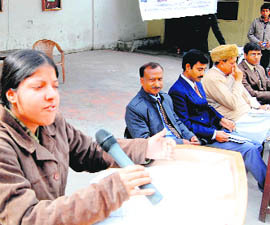 Kalamanch, one of the well-known dramatist clubs of Uttarakhand, staged a drama, ‘Poster’, at Rashtriya Indian Military College. This drama is about the revolution against the injustice done to the poor by the means of ink and paper. It is one of the most famous plays of Kalamanch and this was the 49th show of this drama. 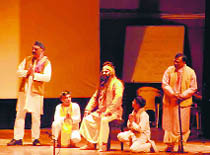 A scene from “Poster” staged by Kalamanch at Rashtriya Indian Military College in Dehradun. In case they begin running their shops on Chakrata Road, even at the remaining portions left after the demolition process, the Mussoorie Dehradun Development Authority (MDDA) will not allow them to put shutters outside their shops. It has also not clarified how much space they are supposed to leave in front of their shops and consider the rest as part of their shops. There is so much confusion around that the shopkeepers are running to (MDDA) office all the time. The MDDA, officers, too keep giving several statements on a single issue compounding the entire dilemma further. Yusuf , shopkeeper, said the traders of Chakrata Road had asked MDDA for a paltry monthly compensation of Rs 15,000 for each of them till the issue of their settlement was fully settled but nothing happened. “With little land I have on Chakrata Road after demolition, I would not be able to run a shop after leaving two metre space. The new shopping complex is not ready yet. How long can we survive in such conditions,” he asked. Ravinder Rawat, another shopkeeper, said the they were not ready to move in the new shopping complex until they got registry of their shops in hand. “The shopkeepers will have to spend Rs 50,000 to Rs 1 lakh to build platforms and furnish their shops in the new complex. It is quite possible that if the Congress comes into power in the state, it may order fresh allotment since many of the traders are not happy with the allotment. It can also order a probe into the previous allotment. In such a scenario, the money spent on new shops would be a sheer wastage and the time thus taken would stretch to four to six months. This will break the back of the already distraught shopkeepers,” he said. The shopkeepers are thus appealing to MDDA officers to issue them the registry of their shops and clear all the policy bottlenecks with regard to their land on Chakrata Road so that this issue could come to an end before the poll results. But the endless confusion at MDDA office continues. The shops allotted to shopkeepers are still being changed. The shop number 50 allotted to Usha Gupta, owner of a shop of electrical items, was changed to 63. She was upset for being pushed behind. The officers are still assuring those shopkeepers who are complaining about getting smaller areas than what they had at Chakrata Road by compensating them with land at the new shopping complex. It is difficult to assess how long this problem will persist. Nautiyal passed away in Bengaluru yesterday, where had been undergoing treatment for some time. His sons Ispati and Panchsheel performed the last rites. State CPM committee member Bachi Ram Kaunswal, a close aide of Nautiyal, has expressed grief over his death. He said Nautiyal was a great human being and a comrade with sensitive human values. He is survived by his wife Deveshwari, sons Ispati and Panchsheel, daughters Anita, Antikshra and Bijli. 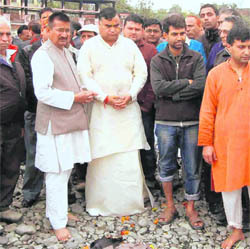 Among others who paid tributes to Nautiyal were Samar Bhandari, Kishore Upadhyay and Satpal Brahamchari. PITHORAGARH: Littérateurs, writers and political activists across Kumaon region today paid their tributes to Vidhyasagar Nautiyal, who passed away on Sunday in Bangalore. His body was cremated today in Haridwar. Political activists in Almora, Pithoragarh and Champawat assembled and praised the literary and revolutionary contribution of Nautiyal. “Nautiyal was born during feudal times and witnessed the exploitation of the poor as well as disparity in society, which snatches from a poor man his pride of being human being. These minute observations in his childhood created a writer in Vidya Sagar, for whom writing was an instrument of social change,” said Dr Ram Singh, a historian and Hindi scholar. The political activists in Pithoragarh remembered Nautiyal as a CPI activist who stood by the hill people till the last moments of his life. “Nautiyal, as all-India president of Students Federation of India, promoted Communist ideology among student and paved the way for further expansion of pro-people politics in the country,” said Amit Joshi, district president of SFI. At Almora, the political activists gathered in an office of a newspaper and remembered Nautiyal as an inspirer of Uttarakhand separate state movement for common Pahari villagers. “We have been highly inspired by his writings and his contribution to pro-people movements, be it Praja Mandal movement before Independence or anti-Tehri Dam movement after it,” said Shamsher Singh Bisht, a political activist of Kumaon region and president, Uttarakhand Lok Vahini. Other writers and poets, including Dinesh Tiwari, PC Tiwari and others also remembered Nautiyal for his writings on the background of hill life. “His autobiography titled ‘Mohan Gata Jayega’ represents the pains of life in hills, life of now defunct Tehri, and his feelings towards human relations in life at various phases,” said Naveen Bisht, a Kumaoni poet and journalist. The writers and journalist in Champawat district also offered their respects to Nautiyal and felt that his loss to the Uttarakhand society and polity could not be compensated in the near future. “Nautiyal lived for poor pahari people all his life,” said Dr Paramanand Chaube, a retired PG college teacher and Hindi scholar. “The writings of Nautiyal, which began in 1949 in the form of Mook Balidan, continued for the next fifty years till he completed Bagi Tehri in 2007. Vidya Sagar Nautiyal lived a life of a committed littérateur as he lived what he wrote,” said Dr Chaube. MUSSOORIE: Eminent authors from Mussoorie mourned the death of Hindi litterateur, social activist and political leader Vidhyasagar Nautiyal who died after prolonged illness at Bangalore yesterday. They termed it as an irreparable loss to the state. Ganesh Shaili, an author and a resident of Mussoorie, while remembering the revolutionary writer said it was sad that Nautiyal was no more. He recollected that he had met Nautiyal in 1970 when he was an MLA in Tehri and found that he was a dedicated communist and ardent revolutionary who worked for downtrodden and neglected people of the state. People like Vidhyasagar gave Uttarakhand the recognition it needed through their writing skills. Eminent historian and author of ‘Mussoorie Ek Dastavez’ Jaiprakash Uttarakhandi said Nautiyal was pioneer of the communist agitation in the state and his contribution in the field of literature was unprecedented.Uttarakhandi further said he first met Nautiyal during the communist movement and when he was contesting the 1970-elections. Uttarakhand Chief Minister BC Khanduri today paid homage to Vidya Sagar Nautiyal, a noted literary figure and political activist, here today. Vidya Sagar Nautiyal died in Bangalore on Sunday and his mortal remains were brought to his residence here. 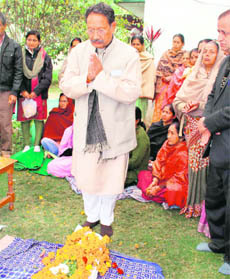 Khanduri went to his residence and paid floral tributes. Speaking on the occasion, Khanduri said the death of Vidya Sagar Nautiyal had created a void in the literary and political circles in Uttarakhand. He recalled his long struggle against the tyranny of the feudal kingdom of Tehri and his later struggle for the common masses. He said Vidya Sagar Nautiyal possessed a sensitive heart and a keen eye that was reflected in his writings that highlighted the plight of the poor common hill people. A large number of people from all walks of life, including leaders of the Communist Party of India (CPI), paid floral tributes at his residence. Later, his body was taken to Haridwar for cremation. Shalini, an IT student, is excited for V-Day tomorrow when she will meet her fiancé after two years. “Today, I am busy buying gifts for him, a perfect dress for myself and have planned a movie tomorrow followed by dinner at our favourite eating joint,” she said. But amid such preparations, the Shiv Sena that considers to be the moral police of the society, has pulled up its socks to protest against the celebrations of the Valentine’s Day tomorrow. “We tried to give a memorandum to the SSP earlier this week informing the party’s protest to shun the lewd activities in the city on Valentine’s Day. But due to the unavailability of time for a meeting with the SSP, the Shiv Sena handed over the memorandum to the SP (rural) stating that the public display of affection by couples will be objectionable,” he added. However, Bisht also said the party workers would stage a demonstration at Clock Tower at 12 noon tomorrow against the celebration of Valentine’s Day in Dehradun and would later start visits to all parks, restaurants and other public places. The local shopkeepers met SDM, Mussoorie, Jharna Kamthan at her office today and apprised her about the problems being faced due to the sewerage project at Library Bazaar. The traders said as the old sewerage still existed on the adjacent road behind the market, there was no need for the new project on Mall Road. They added new sewerage in the area was not required and the existing system should be improved. The SDM after hearing both Pey Jal Nigam officials and traders ordered the project to be halted till all options were considered. The Pey Jal Nigam officials, acting on the SDM’s directions, stopped the project and filled the dug up area with earth. The residents of the town were agitated at the unscientific way in which the department concerned was implementing the project and had demanded its better planning. The multi-crore project being implemented under the Jawaharlal Nehru National Urban Rural Mission (JNNURM) envisages the overhauling of the old and dilapidated sewerage that has not been replaced since Independence. Students listen to experts at an environment awareness event at Mool Chand Shastri Vidyapeeth in Haridwar on Monday. This was stated by Ashok Sharma, Principal, Mool Chand Shastri Bal Vidyapeeth, Sati Kund Kankhal, at a debate on the school premises today. On the occasion, students were apprised of the damage human beings are causing to the environment. He urged students to plant as many saplings. Through charts, experts informed the students about the ill impact on the nature due to increasing human interference. Later, students were asked to put on canvas their thoughts. Ritu, a student, said from now she would make sure that lights were switched off when no one was in room and urge her parents and others to use jute or paper bags instead of polythene bags. Over 150 parents were present on the occasion and also participated in the various events. The theme of the show was ‘Valentine’s Day’ where students between the age group of one to four participated. Child specialist Dr Alok Semwal examined all students before the show began. The title of cheesy cheeks was bagged by Agastya Tamta, Shiv Suri won the curly hair title, Sarthak Sharma was given the title of smiling face, Daksha won the twinkling eyes title while Kavya Kanthwal bagged the title of sparkling teeth. The launch of the video album was organised at a city hotel. Eminent people from the Garhwali film industry were present on the occasion. Narender Singh Negi, a Garhwali singer, was the chief guest on the occasion. Ravindra Lakhera was a special guest on the occasion. Negi congratulated Himalayan Films Private Limited for providing a platform to the young talents of Uttarakhand and promoting the culture worldwide. It was directed by TK Aggrawal who was also the light designer for the play. The major roles in the drama were Sandeep Nayak (Patel) and Shailja Sharma (Chaiti). The drama was a great success at the RIMC. Three cadets of the RIMC also acted in the drama and their acts were appreciated by all. It was also enjoyed by the students of Jaswant Modern School, Unison World School and Hopetown Girls’ School. The chief guest on the occasion was Col Pankaj K Kumaria, Commandant, RIMC, who said such plays helped connect the cadets with the problems of society. Lt Col Ambarish Tiwari, Dr Jagriti Dobhal, Wing Cmdr SK Thapliyal, KS Ahalawat and teachers from various schools were present on the occasion.